With all the different kinds of chili and so many chili lovers out there, I had to make a second chili cookbook! I hope you love this second version as much as I do! Thanks to all the wonderful cooks who are apart of both books!! Love you all! Thank you for including my recipe! This is a great cookbook! Hi Bobbe, I thought they would be great with chili! Can't wait to try them! Thank you for sharing the recipe! Thank you Carol! I had to get your recipes in this one! I'm glad you like my book! Wow, cool cookbook! Thanks for including my Cheese Puffs recipe. Hadn't thought of it, but they'd be awesome with chili! Wonderful cookbook, (as usual). All of the recipes look amazing! Thank you Ellen!! 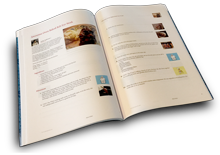 I don't think I can make a cookbook without one or two of your recipes! LOL! I never look to see who's recipe it is as I go by the recipe I think is the best and your recipes win me over every time! I'm so happy your friend won't mind me using her recipe. I love her recipe! Thank you so much again! Wow, Tammy, you have really outdone yourself! What a beautiful and well thought-out cookbook. I see so many things I want to pinch! And thank you for using three of my recipes--rather, two of mine and one of my co-worker and friend, Shonna Jenkins. Wait'll I tell her she's in a cookbook!